*NEW RELEASE* Now you can get 3 Compartment Meal Prep Containers 18 Pack for ONLY $14.44 (Retail $21.99). 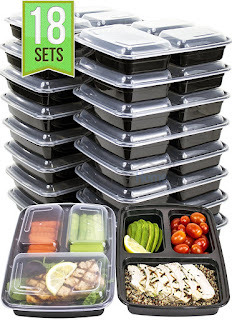 PERFECT MEAL PREP CONTAINERS – These portion control containers come with 18 sets (18 lids / 18 trays) Meal prep easily and healthy meals for the whole family. Misc Home 3 Compartment Meal Prep Containers are 36 Oz and measure 10" x 8" x 2.5"
MICROWAVE &amp; DISHWASHER SAFE - Our exclusive MiscHome™ food prep containers are made of the highest quality eco-friendly, BPA-free plastic material that is safe to use. Its sturdy Bento Box design is built to withstand heat from microwave. The best Tupperware set on the market and we guarantee it. EASY TO USE - Our convenient and versatile 3 compartment meal prep containers are designed to serve the perfect portion you need to carry your meal. Each Tupperware lunch box is 36oz which is the perfect size. SAVE TIME, MONEY &amp; SPACE - These food prep containers are stackable which is practical to save time when you're looking for space in the fridge or cabinet. They are reusable for another go and affordable you're not happy with your purchase of These food storage container with lids. MIsc Home SATISFACTION GUARANTEED! Your purchase is fully protected when you order these meal containers today. We are confident in the quality of our products. Our products are tailor-made with customer's need in mind. I just snagged mine at this price! Shipping is free with Amazon Prime or your $25 purchase. Not a Prime Member? Start your FREE Trial NOW! *Prices can change at anytime!